Calendars are one of the best promotional items you can gift to your clients and customers. It is not only a useful tool that can be used throughout the year, but also the presence of your company’s logo on it gives powerful brand recall for business. 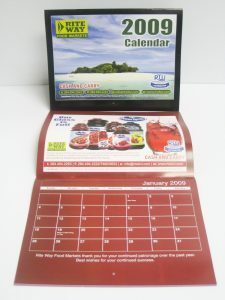 Desk calendars or wall calendars can be printed in full color in various themes and designs. They do not necessarily have to contain content that matches your products or services. You can choose from a variety of themes such as real estates, summer time, religious, medical, and many more. You can even print customized calendars that have planners in them, making them all the more useful and indispensable to your clients. The thought behind providing custom calendars and imprinted calendars to your clients is to increase your connection with them. The more they see your company and the logo in front of them, the more they will recall your product and services when they need them. What better than giving them something that will serve as a beautiful gift and help them plan their schedules throughout the year? Choose from our range of various designs, paper qualities, and color schemes. From postcard calendars to magnet calendars we print them all.